Salama has published numerous articles on comparative literature and modern Arabic literature and film in various journals, including Critical Sense, the Journal of Arabic Literature, Pacific Coast Philology, as well as the Journal of Middle Eastern and North African Cultural and Intellectual Studies. Salama is the co-editor of German Colonialism : Race, the Holocaust, and Post-War Germany published by Columbia University Press in 2011. He authored Islam, Orientalism, and Intellectual History : Modernity and the Politics of Exclusion since Ibn Khaldun ( London, I.B. Tauris : 2011). Mohammad Salama offers a history and analysis of Quranic and literary scholarship in 20th-century Egypt, by focusing on the work of Taha Huysan and Nasr Hamid Abu Zayd. 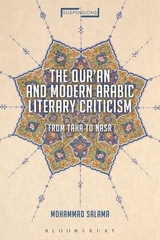 Providing detailed analyses of texts, genres, and events that have, over the decades, inflamed the debate on the validity of literary criticism in approaching the Quran, it gives the modern reader guidance on the labyrinthine semantics that underlie the sacred text and inform scholarship. The Qur’an and Modern Arabic Literary Criticism also provides stimulating reflections on Quranic exegesis by an influential group of classical authors including al-Baqillani, al-Jurjani, al-Ghazali, and ibn ’Arabi. Over the centuries the Arabic language has experienced morphological and phonological mutations that render many dependent on dictionaries and cut off from the past linguistically. The linguistic boundaries between classical poetry and contemporary writings represents the widest breach in the history of Arabic literature. Salama demonstrates that while this divide explains much of the intellectual poverty of ’new’ approaches to Quranic exegesis, the work of these two scholars in the Arab world marks a sharp departure from so-called ’right thinking’. Through analysis of the writings of Taha and Nasr, he argues that a fresh look at the sources and a revolutionary attempt to revitalize Islam can render tradition itself an impetus for a new kind of literary criticism.